Tennessee’s men’s basketball team has never been a one-seed in the NCAA Tournament, let alone the top overall seed in the tournament. But that’s exactly what one of the top college basketball analysts is predicting will happen in a couple months. According to Jerry Palm of CBS Sports, the Vols have moved up to the No. 1 overall seed in his latest NCAA Tournament bracket projections. His bracketology now has the Vols projected as the top seed in the tournament, followed by Michigan, Duke, and Virginia as the other No. 1 seeds. The Vols downed Alabama despite a furious comeback attempt on Saturday, and every other team in the top four of the AP Poll lost at least once this past week. No. 1 Duke lost to unranked Syracuse at home in overtime on Monday, No. 2 Michigan lost on the road to Wisconsin by 10 points, and No. 4 Virginia lost to Duke on the road in a close game. 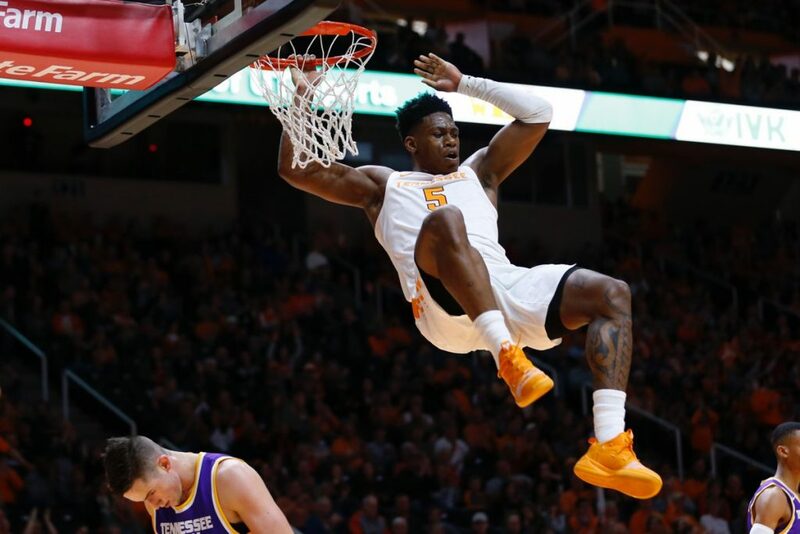 Tennessee has now won 12-straight games on the season, and their 16-1 record is tied with both the 2007-08 team and the 2000-01 team for the best start to a season in program history since the Vols joined the SEC in 1931. The Vols’ 12-game winning streak is tied for the fourth-longest winning streak in school history. Three of Tennessee’s opponents are listed as No. 2 seeds by Palm’s updated bracket predictions. Kansas, Gonzaga, and Kentucky are all two-seeds in his latest bracketology. The Vols lost to Kansas (their only loss of the season) in overtime, beat Gonzaga (who was No. 1 at the time), and still has to face Kentucky twice in the regular season in the coming months. All in all, eight teams on Tennessee’s schedule from this season are in Palm’s updated 68-team field for the NCAA Tournament. Last year, the tournament’s top overall seed, Virginia, lost in the first round. That marked the first time in NCAA Tournament history that a No. 1 seed lost to a No. 16 seed. The Cavaliers were toppled by UMBC, and the game wasn’t even close. Virginia lost 74-54 to the Retrievers. Before last year, the top overall seed in the NCAA Tournament made it to at least the Elite Eight in five of the previous six years. Of those five teams that made it to at least the Elite Eight, four of them made it to the Final Four, and two of them (Louisville 2013, Kentucky 2012) won the title. The Vols have been a No. 2 seed twice in program history, but never a No. 1 seed. Last season, Tennessee earned their first-ever three-seed in school history. Tennessee was bounced in the second round by NCAA Tournament cinderella Loyola-Chicago. The Ramblers would go on to make it to the Final Four last year.